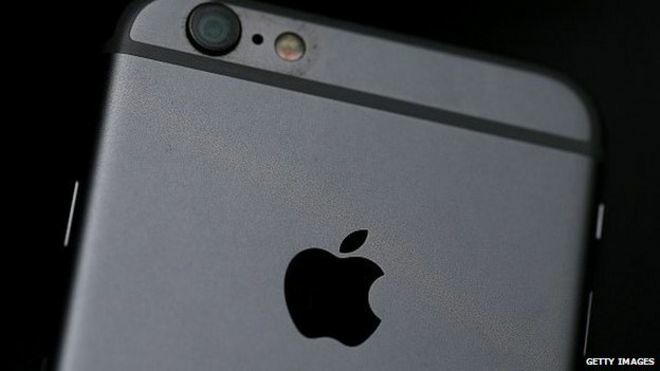 A factory which allegedly made up to 41,000 fake Apple iPhones has been raided in China, with nine arrests. The operation reportedly involved “hundreds” of workers repackaging second hand smartphone parts as new iPhones for export, with counterfeit phones produced worth 120m yuan ($19m). The factory was discovered on 14 May but was revealed on social media by Beijing’s public security bureau on Sunday, according to reports. The operation was set up in January. It was led by a husband and wife team, on the northern outskirts of the Chinese capital, according to Beijing authorities. They said they had been alerted to the factory by US authorities which had seized some of the fake phones. The reports come amid an official Chinese crackdown on counterfeit goods, with authorities pushing firms to trademark their goods. China has also agreed to work with the US authorities to try to stem the large quantities of fake goods flowing between the two countries. The discovery of the factory comes four years after fake Apple stores were found in Kunming city, China. Discovered by blogger BirdAbroad, the fakes were so convincing she said many of the staff themselves were convinced that they were employed by the US electronics firm. via Apple ‘fake factory’ raided in China – BBC News. 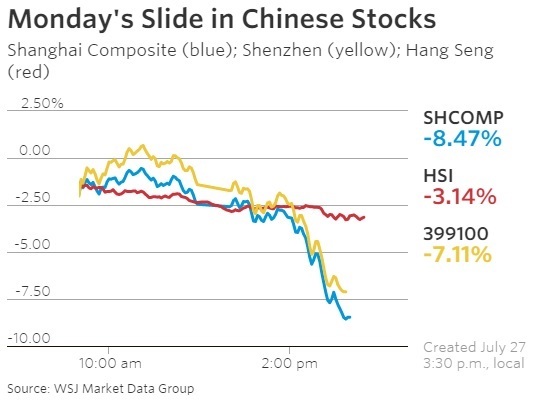 The Shanghai Composite Index ended down 8.5% at 3725.56, its second-straight day of losses and worst daily percentage fall since February 27, 2007. China’s main index is up 6% from its recent low on July 8, but still off 28% from its high in June. Analysts say the selling came as investors fear the government is curbing its buying of blue-chip stocks—and could even be testing whether the market can support itself. 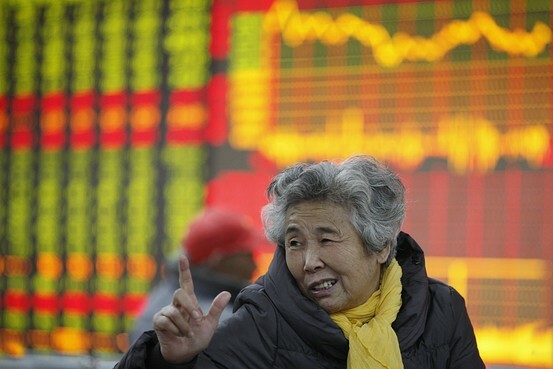 via China Stocks Make Sharpest Daily Fall Since 2007 – China Real Time Report – WSJ. China added a record 17 million new cars on the road in 2014 as car ownership reaches 154 million, said the Ministry of Public Security on Tuesday. Strong demand for cars has helped the automobile replace the motorcycle as the main method of transportation. Cars made up 58.6 percent of total motor vehicles, a sharp rise from 43.9 percent five years ago. The number of people obtaining driving licenses also ballooned from 219 million in 2013 to 247 million as of the end of 2014, said the ministry, adding 29.7 million drivers have fewer than one year’s driving experience. Of the 35 cities which have more than one million cars each, ten have more than two million cars, including Beijing, Chengdu, Shenzhen, Tianjin, Shanghai, Guangzhou and Chongqing. The ministry said the number of passenger cars has reached 117 million, 90 percent of which are private cars. Beijing has the highest private car penetration, with 63 private cars for every 100 households, while the average is 25 private cars for every 100 households. Carmakers have enjoyed strong sales over the years, with more middle-class customers placing orders for their first cars. But with frequent traffic jams, it is yet to be seen whether cars can still ride the booming tide in the years to come. More local governments have begun to limit car use, among them eight cities have quotas for new car plates. via Car ownership tops 154 million in China in 2014 – Xinhua | English.news.cn. Volvo to Export Sedan Made in China to the U.S.
Before he took his life in late September, 24-year-old Xu Lizhi was a regular contributor of poetry to Foxconn People, the internal newspaper at his sprawling factory complex in Shenzhen. Only after he died did his writing find a wider audience, as factory friends collected his poems for publication in the Shenzhen News. Like millions of other young Chinese, Xu left his home in rural Guangdong province in 2010 to find work in the big city; he had been working intermittently on Foxconn (2317:TT)’s electronics assembly line for four years. Following a series of 14 suicides in 2010, the Taiwanese manufacturing giant installed safety nets to prevent workers from jumping off dormitory roofs at its Shenzhen plant. It tried to improve life for its workers: The company raised basic wages and installed basketball courts and Olympic-size swimming pools for recreation. Worker suicides declined but did not disappear. via Poetry of a Former Foxconn Worker in China Evokes Images of Factory Life – Businessweek. China’s intensifying anti-corruption campaign has turned its guns on the people who link government and business, forcing nearly 230 senior Communist party officials to quit the company directorships they hold on the side. The draconian orders, which have also affected tens of thousands of more junior officials moonlighting for corporate China, are said to have unleashed a mass “exodus” of independent directors from listed Chinese companies in recent months. The government has promised there will be more to come. China’s state news agency warned that the authorities were planning another “detailed directive” that analysts believe would attempt to tighten further the restrictions on the roles officials can play in the private sector. The rules are expected to crack down on the activities of retired officials: as the rules stand, they are able to take on company directorships if those positions do not relate to their former specialities as civil servants. Sources believe that the new directives will broaden the terms of the ban in a way that could affect foreign companies in the mining, energy, banking and pharmaceutical sectors. The same burst of anti-corruption propaganda also invited the public to “blow the whistle on violations”. The crackdown began last autumn with a ban on senior government and party officials from working for outside companies. Although a few resignations followed that ban, the real purge did not begin until scores of listed companies were subjected to an inspection a few months later. That inspection, according to Chinese state media, identified 229 officials at the ministerial or provincial level who were working for outside companies and 40,700 junior officials with a source of company income outside their civil servant salaries. About 300 Chinese companies listed on the Shanghai and Shenzhen stock exchanges have apparently been affected by the shakedown, losing the officials they specifically hired to build relationships with Beijing and bring the companies closer to the government. The central role of those relationships within Chinese business has been laid bare over the past two years as details have emerged of the fabulous wealth amassed by the families of senior officials. 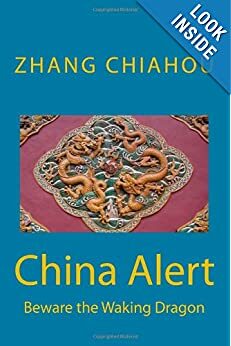 Also exposed has been the extent to which western companies operating in China have been convinced that their success can only be guaranteed by hiring either former officials or people with exceptionally strong personal links to the central and provincial governments. via Beijing gets tough on party officials who go private | The Times. Chinese video sharing site QVOD was ordered on Thursday to pay a fine of 260 million yuan ($41.8 million) over copyright infringement. Shenzhen QVOD Technology Co., Ltd. should pay the fine within 15 days of receiving the administrative punishment or be charged a late fee of 3 percent of the fine for each day, said Fang Canyu, a law enforcement officer with the Shenzhen Market Supervision Administration. The firm should pay the fine first even though it can apply for an administrative review within 60 days or file a lawsuit within three months, Fang said. The hefty fine is three times the illegal earnings QVOD made by violating others’ information network transmission rights, according to the administrative ruling. The imposition of hefty fines has proved to be very effective in curbing copyright infringement cases, said Zeng Raodong, head of the laws and regulations department under the Shenzhen Market Supervision Administration. The punishment was given days after a hearing on June 17. QVOD streamed 24 films and TV dramas even though it was fully aware or should have known that third-party video websites infringe copyright, Fang said. The company, founded in 2007, used to offer pirated and pornographic videos with peer-to-peer video streaming technology. Its user base quickly grew to 300 million. via Video sharing site fined $42m for copyright infringement – China – Chinadaily.com.cn. Shenzhen will pump one billion yuan (HK$1.26 billion) into a new university to be built in Xinjiang’s southern Kashgar city, on top of the region’s own one billion yuan of investment. Shenzhen was contributing to the university in support of education in the Xinjiang Uygur autonomous region, the Xinjiang Daily reported on Monday. “Building Kashi University will provide strong human resources to the industrial restructuring in southern Xinjiang and improve the local livelihood,” said Kenjiang Tulahong, a member of the region’s National People’s Congress Standing Committee. Plans to build the university were announced by the State Council after a Xinjiang working group meeting in May. It was an important strategic approach, the newspaper said. Xinjiang, in the northwest and home to the Uygur ethnic minority who are mostly Muslims, has been the focus of a security crackdown after recent violent attacks in the region and elsewhere on the mainland that the central government has blamed on terrorists and separatists who want to establish an independent state called East Turkestan. President Xi Jinping, who chaired the second Central Work Conference on Xinjiang on May 19, stressed the importance of ethnic unity, education and economic development. Officials at the conference pledged to promote bilingual education and interaction between ethnic groups in the region. On Monday, Xinjiang party chief Zhang Chunxian, speaking at the region’s party committee meeting, vowed to safeguard social stability and the Central Committee’s authority and political discipline on major issues opposing separatism. The same day, Korla Evening News reported that police in Korla city, western Xinjiang, had busted an underground group that was teaching the Koran to children. Two men were arrested on suspicion of abusing two children and forcing them to study the Koran, on top of running illegal religious activities. The two pupils were then sent to local kindergartens and assigned guardians, the newspaper reported. Kashi University, when completed, would give Uygur students more opportunities for higher levels of academic training in future, Kashgar officials said. “Kashi University will have comprehensive departments and disciplined teachers to train a wider range of talents,” Kashgar Normal College dean Aierken Wumaier said. The university plans to provide curriculums in the liberal arts, science, art, engineering, management, economics and medicine, among others, he said. The institute aimed to recruit 13,000 students by 2015, he added. via Shenzhen to pump one billion yuan into building new Xinjiang university | South China Morning Post. In concept, a company’s independent directors serve to check abuse of power and protect shareholders. 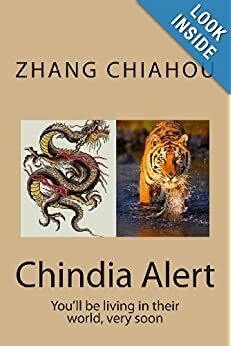 In practice here in China, they’re often seen as a vehicle for corruption, as companies stack their boards with government officials who accept handsome compensation for the post and do an indifferent job. China’s central authorities have been cracking down on the phenomenon, with the Communist Party issuing a circular last October banning officials and college professors from holding second jobs. According to the state-run Xinhua news agency, as of this week, more than 200 listed companies have reported independent director resignations. October’s directive—which also said officials could only take on such posts following a three-year cooling-off period once they leave office—isn’t the first time that the party had cracked down on such activities: In 2009 and 2011, the country’s education and finance departments also banned cadres from taking outside jobs or holding independent director posts. Still, according to statistics from the party-controlled China Youth Daily, in a survey of 5,760 independent directors at Shenzhen and Shanghai-listed companies conducted last year, fully 45% had government backgrounds. A Monday editorial in party mouthpiece the People’s Daily said it was important for cadres “not to mistakenly convert their public power into private power, or to mistakenly think they have captivating backgrounds, when in fact all people are seeing is their backgrounds.” Official resignations from company boards, the paper said, would be a way to “purify” the party. The move to purge company boards of officials comes as President Xi Jinping has pushed a broader anti-corruption drive that has encompassed a crackdown on everything from lavish weddings and funerals to red carpets and even luxury mooncakes. After decades of breakneck economic growth that has disproportionately benefited companies and individuals with political connections, the party is eager to erase the notion that the country’s economic system is rigged, particularly as growth has begun to slow, political analysts say. via Why Chinese Officials Are Resigning From Company Boards Left and Right – China Real Time Report – WSJ. China’s younger migrant workers are better educated, spend more, save less, and prefer living in China’s bigger cities. They make up close to one-half of the migrant workforce, according to a survey released Monday by China’s National Bureau of Statistics. Those from the younger generation, born after 1980—or balinghou (literally, “80 after”)—number 125 million, or 46.6 percent of China’s 269 million migrant workers. One-third have a high school education or higher; that’s 19.2 percentage points more than the older generation, the survey shows. Unlike their parents, they aren’t inclined to scrimp devotedly in order to send hard-earned kuai back to the countryside. The average younger migrant worker remitted 12,802 yuan ($2,054) to a hometown in rural China; that’s about 30 percent less than older workers did. via China’s Young Migrant Workers Earn More, Send Less Home – Businessweek. When Wang Yafang was fired from her job at a Walmart in southern China in July 2011 for dishonesty, she refused to sign the termination papers and even showed up at work the next day – only to be sent away. Wang, 38, then sued Walmart Shen Guo Tou Stores Inc, a Wal-Mart Stores Inc (WMT.N) subsidiary, for wrongful termination, and beat the world’s largest retailer in arbitration and twice in court, winning 48,636 yuan ($7,800) in damages. Now, she’s aiming at an even bigger target: the state-backed All-China Federation of Trade Unions (ACFTU). In the three decades since China began reforming its economy, its giant state labor union – with upwards of 280 million members – has sat on the sidelines, rarely intervening on behalf of workers in disputes. In a bid to help change that, Wang, backed by lawyers who have handled some of China’s highest-profile labor cases, decided to sue the union branch at the Walmart in Shenzhen where she worked for nine years. Unlike the few previous attempts by workers to sue grassroots union branches, courts have heard Wang’s case. Wang and her team argue that the union endorsed the assessment of her as “dishonest” when she was fired and in doing so damaged her reputation. She wants an apology. The union branch has denied the charges. Beneath the surface, Wang and her lawyers are leveling a more serious accusation – one echoed by many Chinese workers – that the ACFTU is failing in its role as the protector of worker rights and interests. The landmark case highlights shifting labor relations in China, where workers increasingly know their rights and are seizing opportunities to challenge the status quo, often in court. Independent unions are banned in China, and the ACFTU is coming under unprecedented pressure to adapt. Two courts in Shenzhen have already heard Wang’s case since she filed the suit last July, and have ruled against her. This month or next, her lawyers plan to launch a final appeal with the Guangdong superior people’s court. “Either way, if she wins or loses, it is already extremely meaningful that this case has been brought to trial,” said Shi Zhigang, a former union boss from Nanjing who now acts as a collective bargaining adviser to local union branches. via Fired from Walmart, Mrs Wang is now gunning for China’s state labor union | Reuters.